They all know that to be an effective leader, you need to be an effective communicator. And communication is most effective when it is conducted with the audience in mind. Yes, that’s right. I hate to be the one to tell you this, but it’s not about you. It is always about your audience! Great leaders know that to maximise the impact you have on your intended audience – whether that’s your team, your customers, your peers, your industry networks – you first need to understand how best to connect with them. So, before they engage with one or one hundred of their stakeholders in a conversation, a keynote speech, or through the written word, effective leaders will follow these three simple steps for communication success. First: they get clear on WHAT they want to convey. They distill everything down to one or two key messages that they want their audience to walk away with. This is the one thing they want or need their audience to know, understand and remember the next day…the next week…going forward. Their communication is then built to support this key message. Finally, great leaders know WHY they are communicating this message to this audience. They have a clear understanding of the communication objective. They know where they want to shift their audience from and to? They know what response, action or reaction they want to elicit from their audience. This helps them gauge whether or not their communication has been effective, or if they need to refine and repeat. Before you write your next email, make your next phone call, hold your next meeting, or present your next talk, remember to set yourself up for leadership success by addressing these three simple steps: WHAT, to WHOM and WHY? WHO are you addressing…why should they listen? and WHY are you telling them? 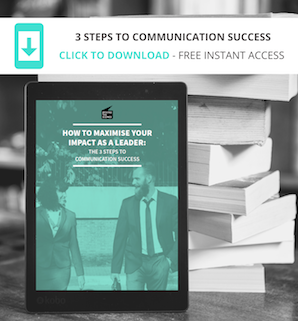 DOWNLOAD your copy of the eBook and start maximising your impact today!